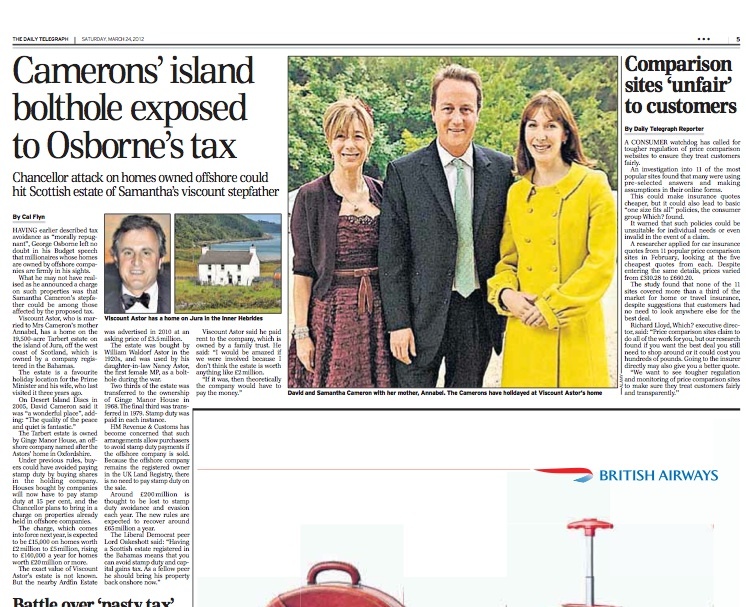 Which of the Cabinet have just handed themselves a tax break? During his response to the Budget today, Ed Miliband challenged members of the cabinet who will benefit from the lowering of the top rate of income tax from 50p to 45p to raise their hands. No-one did. So I did a bit of sleuthing, using the register of MPs’ financial interests and the register of ministers’ interests to see which ministers are likely candidates. The full blog post, with table of calculations, can be found on the Telegraph website here, while the text of the resulting newspaper article is online here or after the fold. I wrote this article about how the prime minister’s landed father-in-law will be affected by the new stamp duty rules introduced in the Budget. In a bid to halt stamp duty avoidance, a charge is to be introduced on all properties held by overseas companies. The charge is expected to be £15,000 on homes worth £2m to £5m, rising to £140,000 a year for homes worth £20m or more. Viscount Astor’s beautiful Jura estate, likely to be valued at well over the £2m cut-off, is a favourite holiday spot for Cameron and his wife. Full text can be found on the Telegraph website here, or after the fold. Those in the top management levels of public bodies, including quangos, often have non-typical remuneration packages which have been negotiated as a one-off. Taking a boost to your pension instead of an annual bonus is a very canny approach: not only is it tax-efficient, but even a small increase to your annual pension is equivalent to a very large increase in the value of your pension pot. 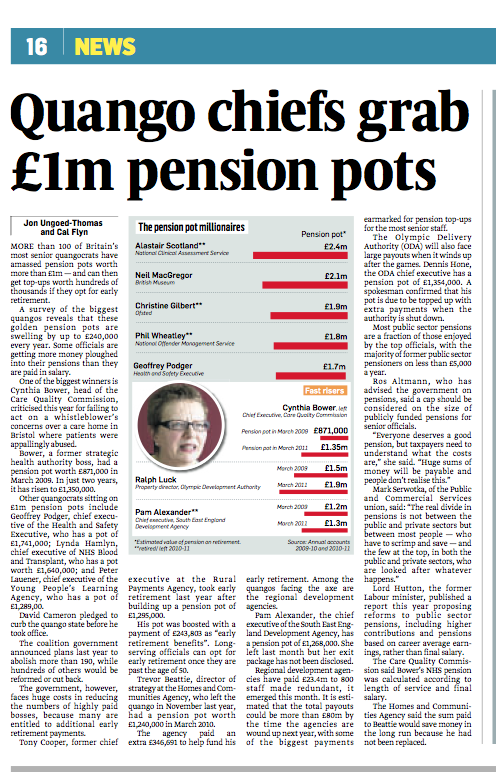 A survey of national quangos for The Sunday Times revealed more than 100 civil servants to have amassed pensions worth more than £1m – that’s more than £100m of payouts for only a small handful of workers. The £3bn annual ‘black hole’ in public sector pensions is fast becoming a major issue (see my previous briefing on Lord Hutton’s pension review), and this figure has been forecast to rise to £7bn by 2015/16. 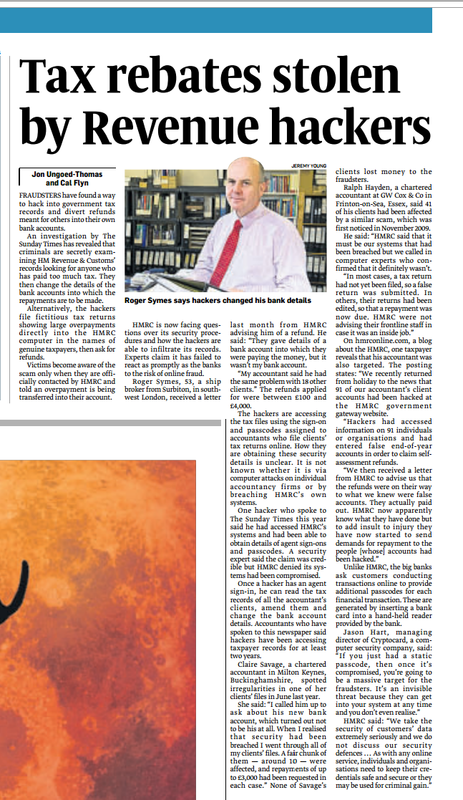 Full text of this article is on the Sunday Times website here, or read on. As part of a Sunday Times reporting team I helped investigate the financial affairs of dozens of premiership footballers. 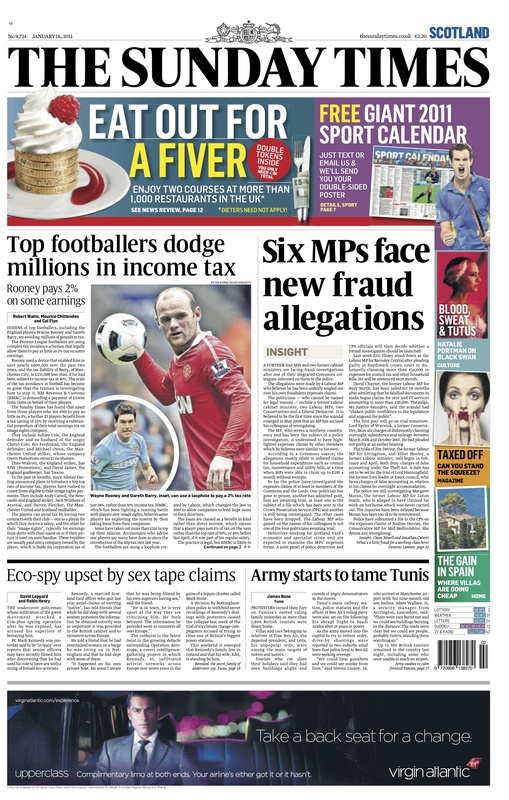 We found that top players, including England defender Wayne Rooney, are able to avoid millions of pounds in tax through complex avoidance schemes. Robert Watts and Maurice Chittenden also wrote an accompanying feature for the ‘focus’ section to explain how the schemes work – find it here.